Travel back in time to the pre-Revolutionary Era, and the colonial city of Boston, in the Province of Massachusetts Bay. Colonists in this, a town of more than 15,000, have begun to chafe at colonial rule. They oppose attempts by King George III and Britain’s Parliament to impose taxes that they see as unjust and excessive. And in their opposition, they have started to turn ever more defiant, and ever more violent. Ethan Kaille, a thieftaker — the 18th century equivalent of a private detective — is an ex-convict, a man with a dark past. He is also a powerful conjurer in a place and time that equates all magick with witchcraft, and all witchcraft with heresy. He wishes only to scratch out a living, to enjoy the few friends he has, and build a life for himself with his love, Kannice Lester. 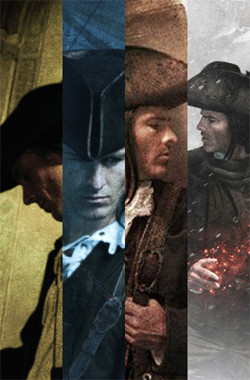 Instead he finds himself challenged in his thieftaking work by a dangerous rival, the beautiful and deadly Sephira Pryce; hounded by Sheriff Stephen Greenleaf, who would like nothing better than to see Ethan hanged as a witch; and caught between the Loyalist powers-that-be, including Lieutenant Governor Thomas Hutchinson, and radicals like Samuel Adams, James Otis, and Paul Revere. Follow Ethan’s adventures in the novels of the Thieftaker Chronicles, the critically acclaimed historical fantasy series written by D.B. Jackson and published by Tor Books, and also in Tales of the Thieftaker, the new short fiction collection from Lore Seekers Press. The novels and stories of the Thieftaker world combine elements of traditional fantasy, urban fantasy, mystery and historical fiction. They are sure to appeal to readers who enjoy intelligent fantasy and history with an attitude.